Want to engage with passive candidates coming from your clinics or store locations? Now you can with Text-for-Jobs campaigns. Imagine someone visits your clinic or store location and has a great experience. Not hard to do, right? Now imagine that same person is wondering if you're hiring. What are the chances they go to your career site and apply? 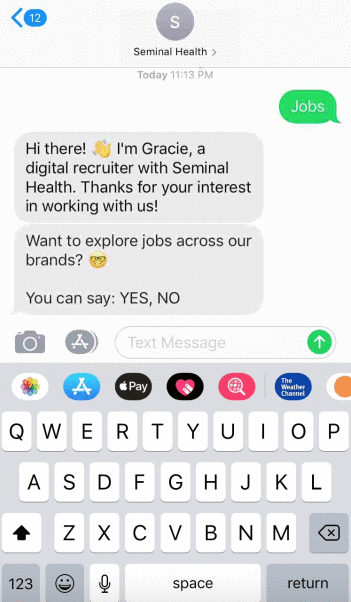 That's why we created Text-for-Jobs campaigns -- to enable candidates to seamless find relevant jobs form them the moment they have a great experience with your brand. Simply text a keyword (e.g. 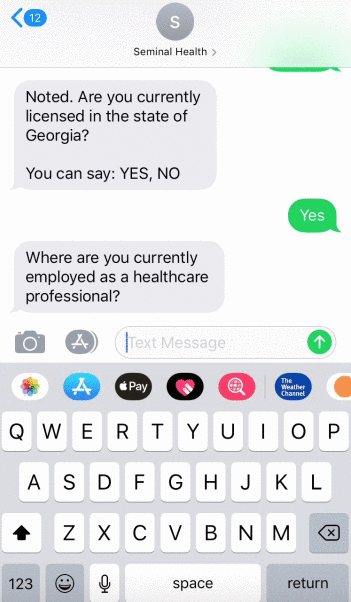 'JOBS') to a phone number (e.g. 44344) to get matched to relevant jobs and even connect with a recruiter if they're qualified. These campaigns are very flexible and easy to set up for your brand. Let's break down the 4 elements of a Text-for-Jobs campaign to show how flexible and impactful they can actually be. 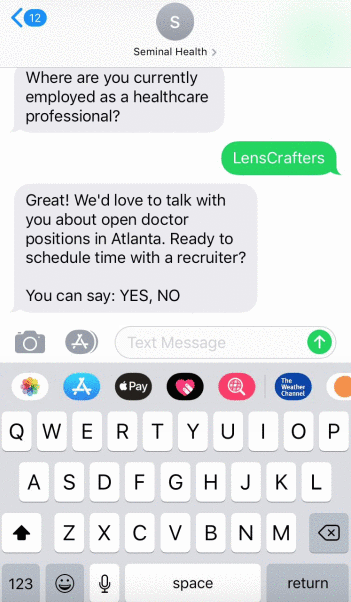 When candidates text in, they will be automatically greeted with a warm welcome that is on brand with your company. Candidates answer a few questions to see a list of open positions from your career site. Without integration required, we can serve up links to relevant job postings for the candidate to review, all without having to make the candidate navigate to your career site. Any and all of these actions can occur based on the candidate's score. For example, top candidates could book time directly with the recruiter, while candidates that score moderately well are sent the link to the job posting to apply. And candidates that are not qualified at all could be encouraged to sign up for the talent community to stay up to date on relevant jobs. âœŒï¸� Thank you for subscribing! Â© 2019 Grayscale Labs, Inc.